Kenya has been jonesing to make gingerbread for weeks, so I finally got out my baking pan and all of the ingredients when he said to me with most intense, focused voice, "Mommy, I wanted to make gingerbread COOKIES". That entire time I had thought Kenya wanted to make gingerbread but in his mind it was all about the iconic shape of the gingerbread cookie. After all, what's cuter or more fun than a cookie whose arms, head and feet you can eat right off before devouring the middle? After a lengthy conversation with Kenya about the difference between gingerbread and gingerbread cookies, I asked him if instead he wanted to make gingerbread pancakes. He immediately broke out into a huge smile. It doesn't take much to persuade my kids to eat pancakes no matter what their flavor. As long as the word "pancake" is involved, they're excited both to eat and make them (just for the record, Kenya got to make the cookies as well and had a blast doing both). Packed with iron, potassium and calcium from the rich molasses, they also offer a sweet, raisin-like flavor that I find kids adore. 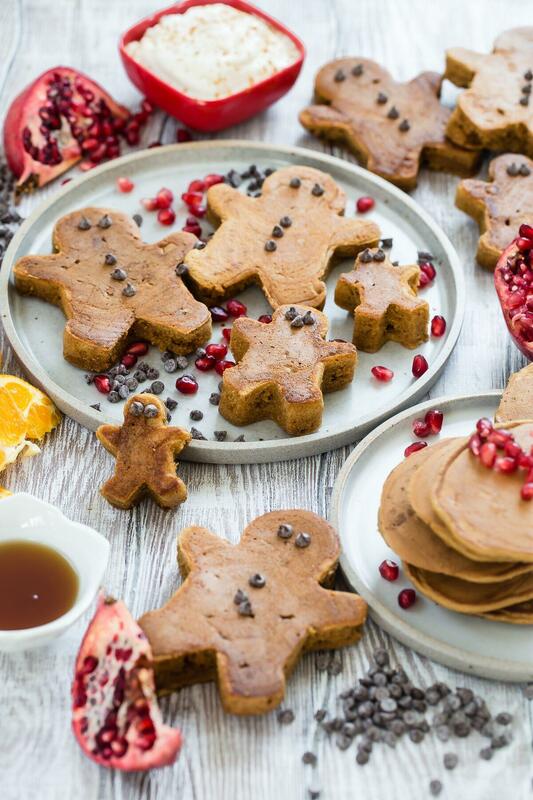 If you haven't ever tried gingerbread pancakes, this is definitely the time of year to do it. Festive and delicious, it's the kind of dish that really makes this time of year feel special! 1. Whisk the dry ingredients in a bowl. 2. In a separate bowl whisk the liquid ingredients. 3. Add the flour mixture to the liquid mixture and whisk until just combined. 4. Let the batter stand for 10-15 minutes to thicken. 5. Place 2 tablespoons of the mixture in a large, greased sauté pan over medium heat and cook for 2-3 minutes on each side. 6. Serve with maple syrup or honey. Is that a man shaped pancake? Did you pour the batter in a cookie cutter or cut it after you finished cooking it? I've tried both - it's a lot easier to cut them out after cooking. And I get to nibble the \"scraps\"! Yes it is a man-shape! I poured the batter into a greased cookie cutter to make the shape. It took a little longer, but was so much fun to have this shape! You could definitely cut the shapes out post-cooking, and have the little scraps to munch on while preparing everyone else's breakfast. Those pancakes look delightful. Love the photo too! Could you use light brown sugar without altering the pancake too much? I used light brown since I was out of dark and the kids LOVED them. oooh, what a wonderful idea! Can't wait to try these! What could you uses instead of the butter? My little one has a dairy/soy allergy. I would replace the milk with rice milk. You can use Earth Balance soy/dairy free \"butter\". We use it all the time in place of butter. Or you could use light olive oil. Earth's Balance is a great substitute! I made this yesterday for dinner. I used coconut oil instead of the butter. I also didn't have molasses so i used a bit more than the brown sugar. They were delicious and my son loved them!!! Did you cook them over medium heat? It's so tough to offer a time with pancakes as everyone's flame and pan's are so different! I hope you enjoyed them! I always use the 'when they start to bubble on top, flip them' timing method for pancakes and it works perfectly to keep them from burning! How did you make the shape?! BTW, I made hte almond cookies and they were lovely - thanks for much! So cute! :) I'm sure my little one will love these! Love the addition of the blackstrap molasses. SUCH a mineral dense, healthy ingredient! Making these in the am! Wow! I think we will try these this weekend! Have you tried any whole wheat flour in place of the all purpose? I usually do half and half. On another note, I love your site on the computer, but have been struggling with it on my iPod. When I search for recipes from your app, it shows the one I want for a moment and then goes back to the current post. When I look through Safari (the browser) it has a window about the app over the screen that I can't get to close. :( This means I'm having to waste paper to print the recipes from the computer (if I have time with the wee ones to run upstairs to print it!)... I'm hoping this can be fixed so I can test more of your recipes. I'm hoping to try some teething biscuits, holiday cookies, and more! Rachel - I use ALL whole wheat pastry flour all the time in lieu of white or 1/2 and 1/2. Haven't (yet!) tried it with this recipe, but I'm sure it'll work. I also have issues with the app. So dissapointed, as I love this site! I have been using a white whole wheat flour from Eagle Mills (bought it at wallmart)It says it is \"Ultragrain whole wheat flout and has 4-1/2 times the fiber of regular flour. The color is not a pure white, but everything I have made comes out fine. Catherine - do you know about this? It is easier than mixing white and whole wheat. Have you tried updating your software recently? When there are glitches with the app, that is often the problem. I try to update mine every month because I find that the app's move faster. I'm hoping that works so you can try a bunch of the recipes! Whole wheat flour works GREAT. I can't wait to try this receipe. Could I use Golden Syrup in place of the Molasses? also how did you make the gingerbread man shaped pancake? So yummy! We had these for breakfast yesterday and I'm making the other half of the batter for breakfast today. Big hit with my boys! Can I use this recipe to make gingerbread waffles? This batter is a little thick for a waffle maker, but try adding some more milk to thin it out. Good idea - I can't wait to try that myself! I just made these..a total hit with my 2 year old twin boys! They were delicious!! I can't wait to try these. Just wanted to let you know that I love weelicious. I've made many of the recipes. My toddlers love them and my husband too! Hi, just wonderinf if I can use Brown syrup in place of the molasses? Please let me know, thanks! Brown Rice Syrup is similar in consistency to molasses so you should be able to use it as a substitute, but it will alter the flavor of these pancakes. Happy experimenting! I just made these this morning with light brown sugar and with the first batch in the pan a little extra brown on the circumference. They were loved by my 2 1/2 year old. I had to turn my heat down to just under the middle (4 on my knob). They were fluffy and super yummy! I made these for breakfast today and my 2 year old and I agreed that they were perfect. I used buttermilk and it worked well! Thanks for another amazing and creative recipe! MY husband makes breakfast for our kids and I every Saturday morning. I found this recipe a couple days a go and e-mailed it to him. Then put in a special reuest :) He made them this morning and they were delicious! He made some whipped cream, and we added a dolop on top of the maple syrup! Thanks for the great recipe! Yummy! I gave the kids round pancakes and cookie cutters and let them cut their own shapes. Finally tried these this morning. Didn't have cloves and they still turned out yummy! Loved by my 2.5 year old and not overly sweet like I thought they could be. I also used 1/2 white flour and 1/2 brown flour...still nice and fluffy. Thanks Catherine for another great recipe! Could I make the batter today and put in the fridge till tomorrow? Not sure with the melted butter if that would work...maybe mix the dry in a bag and mix in wet in the AM? Just made these this morning- they are delicious! Just the right sweetness. My 3 year old and 16 month old loved them! Thank you for another great recipe. Yum! Perfect easy pancake variation. I don't keep molasses on hand, and used dark agave instead. These are currently my sons favorite pancakes! Loved these as pancakes! Is there a way to convert them to muffins? Do these freeze well? Thanks! I have seen several comments about making round pancakes and then cutting them out. Can you place cookie cutters (metal ones) in the pan and pour the batter into it? Does that leak or cause them to cook unevenly? Yes, you can do that! Just make sure to grease them well! Wow how smart. 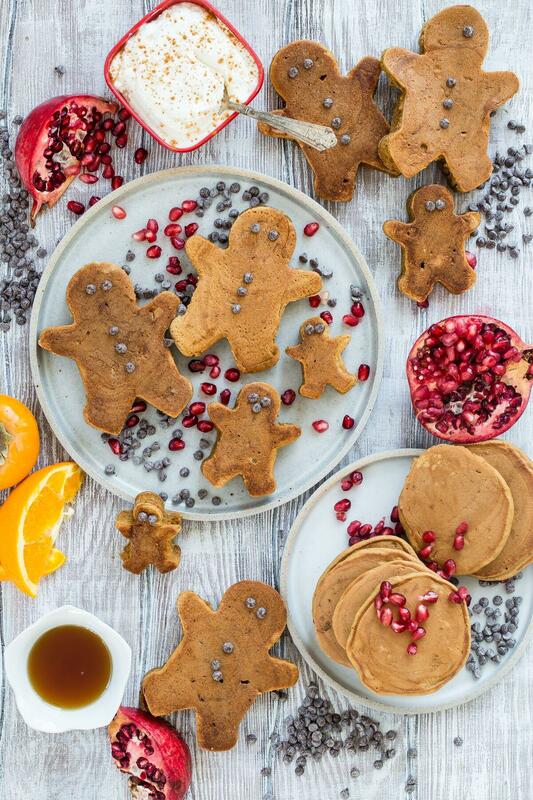 A ginger bread pancake. These sound amazing. Cant wait to try and i bet my son will love them. Thanks for such a great recipe.